Construction is not traditionally an industry that one would think would derive much benefit from the use of applications for mobile devices. After all, construction firm employees are supposed to be busy renovating and building things, not playing with smart phones and tablets, right? But those familiar with this industry know that a great deal of written reports, updates, and alerts come with it. For practical reasons, much of this reporting can't be completed by administrative assistants in offices far from a work site. Project managers, supervisors, site foreman and other workers often do reporting and other paperwork directly in a project area. Logistics often used to call for these reports to be handwritten, and storage space on-site for this paperwork was either limited or non-existent. Completed paperwork either had to be mailed or hand carried to appropriate recipients. And there was always the risk of important documents being damaged, lost, or ending up in the wrong hands. But construction mobile apps like Raken has changed all of that. It allows its users to file daily construction reports and fill out documents online, storing them with cloud technology. The results are professional looking paperwork, that all appropriate parties can both view and add to, in real time but in different locations. This ability to work collaboratively from separate locations reduces the need for face to face meetings and speeds up the administrative process, meaning that firms can save money in vehicle fuel and mileage, as well as eliminating additional staff and overtime costs. And apps like Raken’s work as construction safety apps and save money by reducing safety issues as well. Updated weather reports can be viewed with this software. Sighted safety issues can be reported and photographed in real time, and passed along before they become real problems. As a result, site injuries and equipment damage can be reduced. 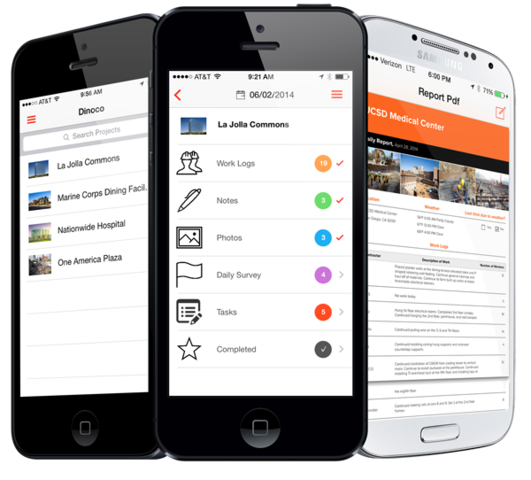 And because apps like Raken's are designed specifically for reporting within the construction industry, proper reporting formats and technical language are already provided. The wheel need not be reinvented. And the apps are as easy to access as any other available on a device. New work place tools can cause some anxiety when adopted. But given that construction apps reduce work time, improve safety and communication, and are cost effective, firms shouldn't hesitate to embrace them.